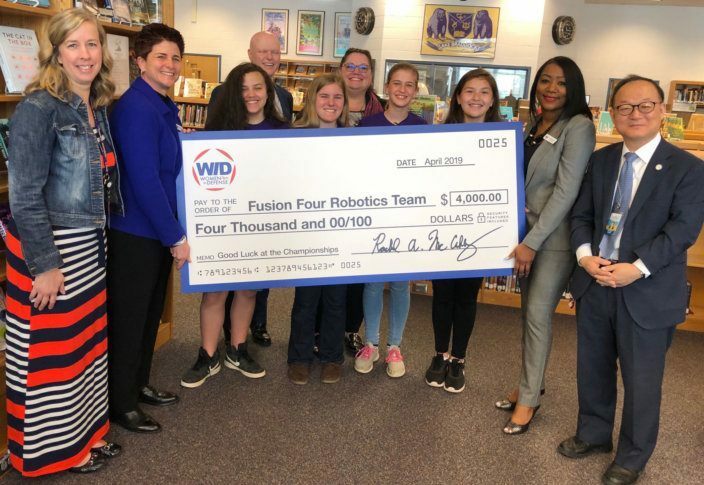 An all-girl robotics team from Fairfax County now has help paying for the trip to an international competition later this month, where they'll represent Virginia and D.C.
“Thank you so much,” the girls replied in unison. Fusion Four will compete in the 2019 FIRST (For Inspiration and Recognition of Science and Technology) Lego League World Championship in Detroit, to be held April 24-27. The check presentation occurred at Lake Braddock Secondary School, where team members Ema Hrabak, Minah Sisco and Reira Erickson go. Devon Rudolph attends Robinson Secondary School, in Fairfax, Virginia. All the girls are 12 years old and in 7th grade. “These are the young women who, 15, 20, 25 years from now — they’re going to be leaders in our country,” McCaffrey said. The girls held a car wash last weekend to raise money for the trip; that money, and their GoFundMe campaign, now can be used for incidentals. They agreed that getting the sponsorship money takes off a lot of pressure. After the check presentation, McCaffrey told the girls about seeing Helen Greiner, the co-founder of iRobot, speak at an event Wednesday. The team’s all-girl status gets a lot of attention when they compete, but it’s a growing trend. If the girls come back successful, McElveen said, he and Moon will ask Superintendent Scott Brabrand to call off school for a day in their honor.